← Romantic Glamping Getaway For Under R800 ! 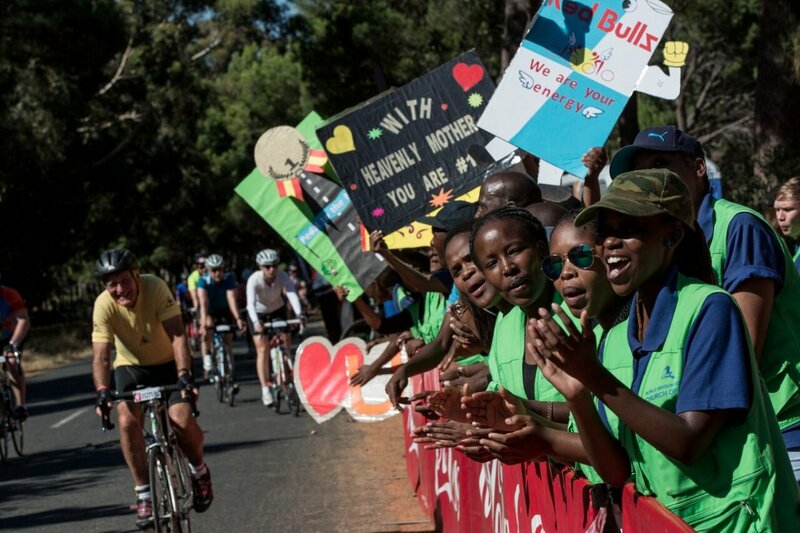 On Sunday 10 March 2019 , Cape Town stops for bicycles and cyclists as 35 000 participate in the Cape Town Cycle Tour. It all stared in 1977 as a protest to campaign for cycling paths in and around Cape Town. 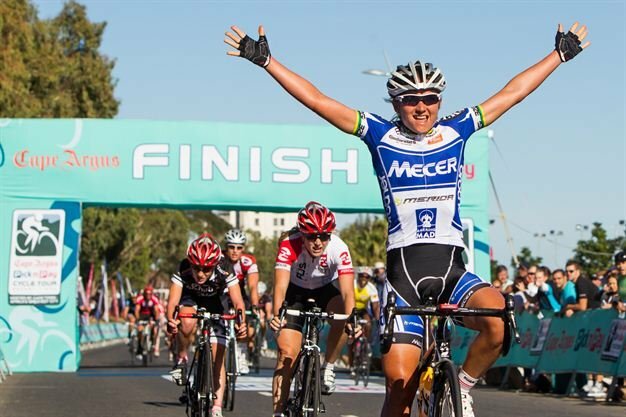 It became known as the Cape Argus Cycle Tour, a name which has since changed but still sticks with some die-hard locals. Today this event is largest timed bike race in the world! The Cape Town Cycle Tour route is 110km of scenic beauty beginning in Cape Town City Centre, heading south through the peninsula suburbs, along the False Bay Coastline from Muizenberg to Smitswinkel Bay, then heading up the Atlantic Seaboard, over Chapman’s Peak Drive and finishing in Green Point. For most of the cyclists the “race” is non- competitive but rather a social and festive occasion – many people ride for charities, many ride with friends and the colourful cycling outfits are only matched by the colourful spectators. Capetonians (and Penguins) turn out in their droves to watch, to cheer and to support the riders. Spectators help with broken bikes and changing tyres, they splash water and share everything from bananas to beers with amateur cyclists. 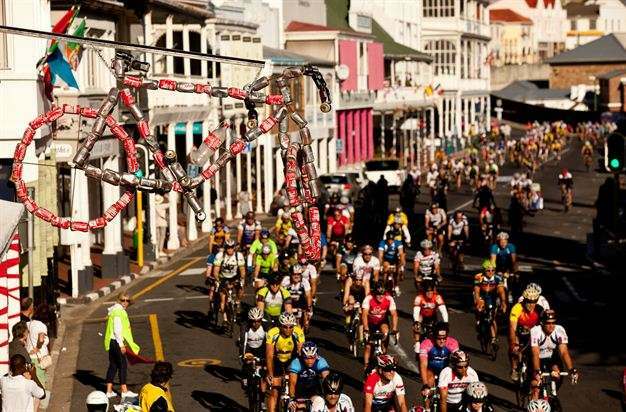 Capetonians and visitors who are not part of the race should take note of the road closures as many residents in the south peninsula can get stranded for the day if they have not paid attention to the road closure details! This is crazy but fun for spectators with lots of anticipation in the early morning air: 35 000 bicycles leave the same spot between 6h15 and 10h00. 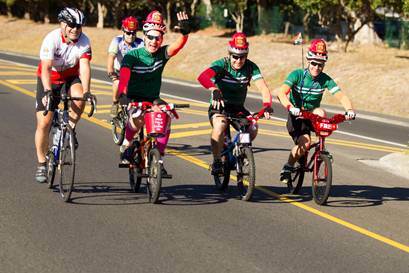 Be sure to WALK to the corner of Adderley Street and Hertzog Boulevard and see the rare sight of so many cyclists all in one place. If you like a bit of drama – this is often the spot to catch some action as they cyclists dash off in groups and jostle for position within their seeded groups. This is the first real climb of the cycle tour and it is much easier to identify your cyclist friends when they travel more slowly! Cheer them on from Wynberg Hill. The footbridge which crosses the M3 is a popular viewing spot for Argus Spectators. The cyclists are still pretty serious at this point but viewing the riders from here means you can get across to Hout Bay for some double viewing and supporting. Muizenberg is a popular viewing spot as the cyclists get their first view of the sea – so more likely to be looking up and around and see the spectators, rather than concentrating on the bike in front of them. The road has been repaired so it’s wider and smoother for cyclists than the last time they rode along the main road. The stretch to St James is also superb for viewing as there is a refreshment station at St James Train Station. An extremely popular spot for spectators who combine breakfast visits at one of the many restaurants with cheering for their loved ones as well as random strangers! The cyclists are no longer coming off Boyes Drive and rounding the corner onto the Main Road so expect less spills but you can watch from the luxury of your favourite breakfast spot! Accompanied by music and breakfast skottels – the good folk from Fish Hoek have a “Breakfast on Main” Argus party near the Fish Hoek Circle to cheer on the cyclists. 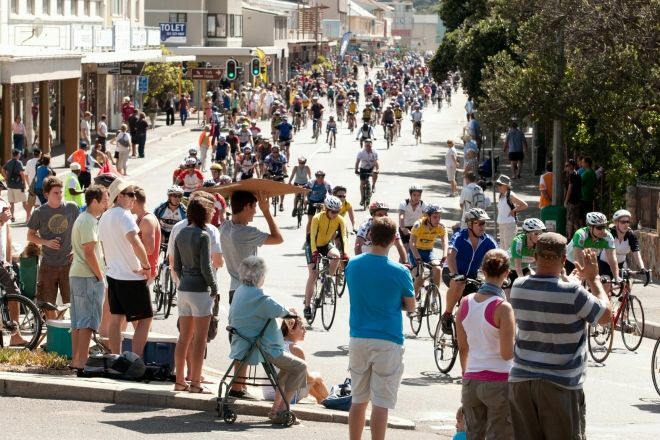 The pace often picks up as the cyclists head out of Fish Hoek so quite an entertaining and accessible spot to watch The Cape Town Cycle Tour. As the Fish Hoek locals say -“Join the Gees”! 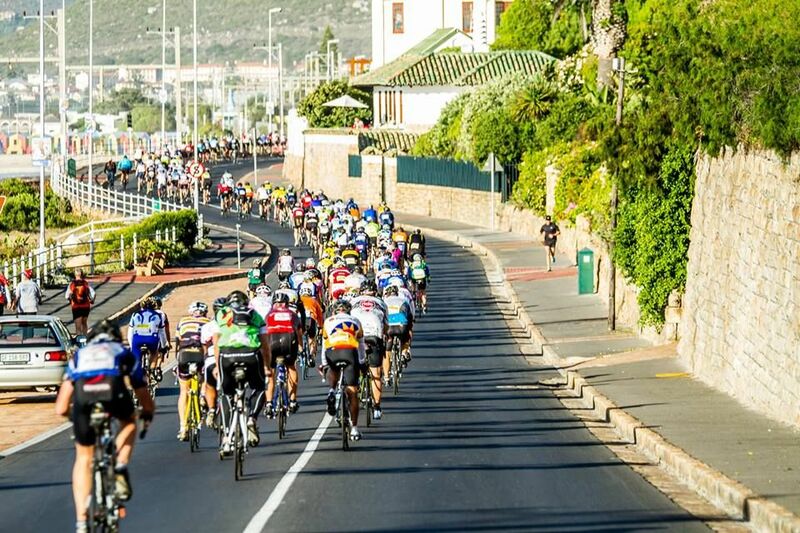 There is an excellent long stretch to view the cyclists and is another rocking spectator spot for local residents as there is pedestrian access to the grassed area in front of the Glencairn Strip. There will be a marquee with music and shade outside the Viper Lounge. Boerie Rolls and lots of spectator refreshments available. There is also a refreshment station at the Glencairn Expressway! This is the 40km mark for the Argus Cyclists and there’s a big refreshment stop at Jubilee Square, complete with a medical point and physio! Simon’s Town is always a hub of activity and has been one of the most popular spectator spots over the years- the friendly residents always create an excellent vibe with lots of support. Visitors can get there by train. The Village Hub is no doubt the place to offering diners a relaxed, casual dining experience – with the usual offerings of Pizzas and burgers, plus a few extra seafood specialities. Centrally located on the Main Road for best viewing on the deck. Watch the relief as the cyclists come off Chapman’s Peak Drive and catch a breather before Suikerbossie Hill . It’s a great spot to get your own refreshments as a spectator with some brilliant ice-creams! 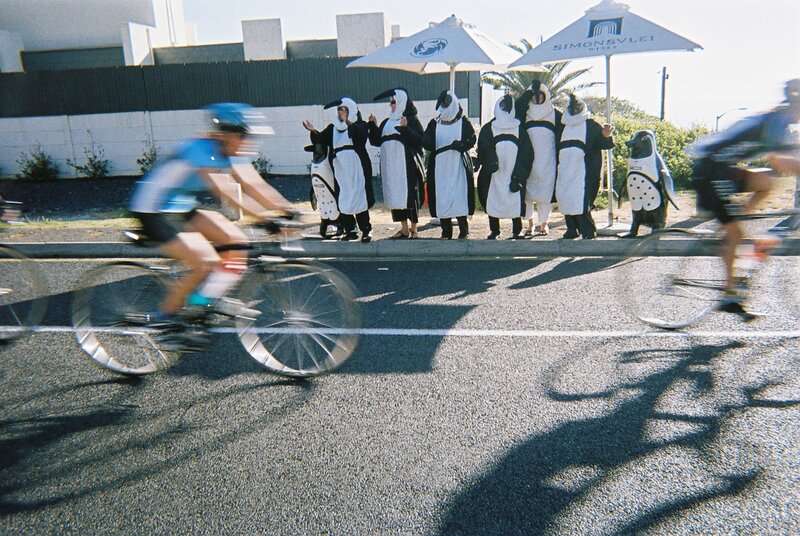 The residents often dress in pink and spray the cyclists with water and cheer enthusiastically. It’s very festive and a huge encouragement to the cyclists of the Argus. It’s not the toughest hill on the route, but it’s the last major one and most Cycle tour participants dread Suikerbossie as they are weary! With 18km to go from the bottom of the hill, the Argus cyclists need lots of encouragement to get up the hill in anticipation of the home stretch. The entire hill is packed with spectators who set up camp for the day with skottel braais and picnics. It’s a fun and festive spot to watch and catch up with walking cyclists! Always popular with spectators due to the volume of restaurants on the side of the road! This makes watching extremely easy and the views are great. Oh yes – and there are tired cyclists coming past that might just need a cheer or two. Excellent Argus viewing spot to watch out for those cyclists who are riding for charity or in fancy dress gear! There is a sharp left turn from Victoria Road into Queens Road so the action can be quite entertaining and dramatic! A temporary pedestrian bridge is set up to enable spectators to cross the road. It’s fun and festive, lots of people come and go so there’s almost as much entertainment watching the spectators!